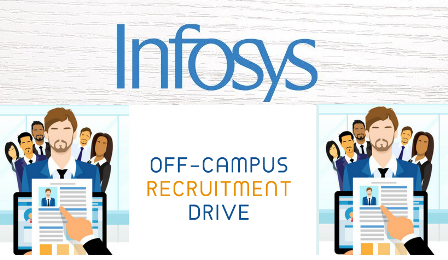 In this post, we have provided Infosys Off-Campus Drive Recruitment Process and Registration Link Freshers. Infosys is the first Indian IT company to be listed on NASDAQ. By 2018, Infosys has completed 25 years of listing on the Indian Stock Exchange. The company is headquartered in Bangalore, India in the year 1981. Today it has more than 2 Lakh employees working all over the world. Candidates who had the passion to work as a Software engineer in Infosys here is the good news. To ensure this opportunity, candidates can participate in the recruitment process that will be conducted by the company's managers. This company is currently conducting off-campus drives in various locations. So the interested and eligible candidates can apply for the off-campus drive using the registration link for freshers provided here. The recruitment process for entry level fresher jobs in Infosys contains 3 rounds. Group discussion will be conducted based upon the Job type and the number of freshers applied. Candidate should have an excellent track record in their academics. Freshers should have excellent English communication skills. Freshers who are applying for the off-campus drive through the registration link have to keep all the academic certificates in hand. Also, they have to carry the below-mentioned documents to the venue of the pool campus drive. Xerox copies of the Mark Sheets. Job Aspirants with above-mentioned eligibility criteria can apply for the off-campus drive of Infosys using the registration link for freshers provided below. They are going to start off campus recruitments only after completing the oncampus direct college placements, Visit the site regularly for updates. That is the only thing you can do. Otherwise do register for AMCAT or Elitmus .